Info: SoulFactory Breathe is available on iTunes worldwide. 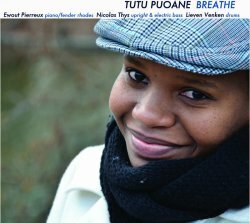 Tutu Puoane – vocals, udu, tambourine, shaker, hand claps. Ewout Pierreux – piano, fender rhodes, hand claps. Nicolas Thys – upright & electric bass, guitar on Dream & extra floor tom on ‘Dream On’, hand claps. Lieven Venken – drums.